Product information "Uric Acid Assay Kit"
Uric acid (urate) is the end product of human purine metabolism and is mainly excreted in urine. Many factors, including genetic components and acquired factors, such as obesity and alcohol consumption, influence serum uric acid concentrations. Hyperuricemia induces or facilitates gout, kidney stones, metabolic syndrome, hypertension, and renal and cardiovascular disease, while exercise-induced acute renal failure is a significant complication of renal hypouricemia. 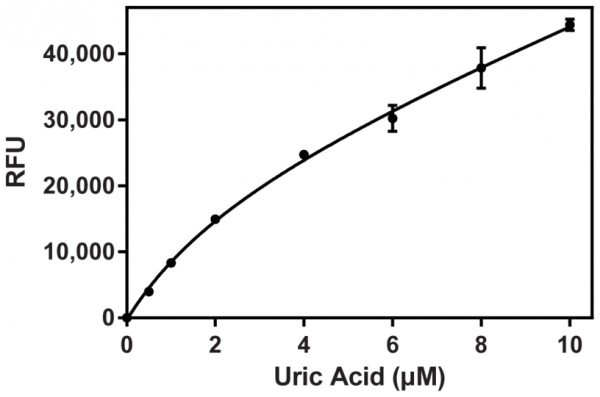 Cayman's Uric Acid Assay provides a fluorescence-based method for detecting uric acid in serum, plasma, and urine. Customer review for "Uric Acid Assay Kit"